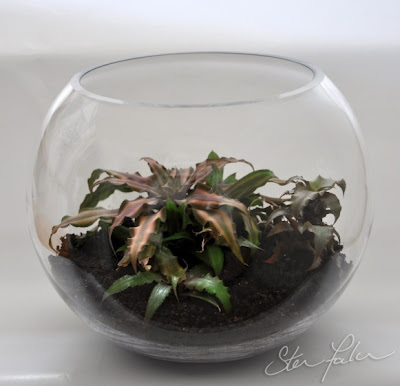 I’ve filled it with a type of bromeliad commonly called Earth Stars but their botanical name is Cryptanthus. These guys are mostly native to Brazil and are almost all terrestrial (they grow in soil rather than clinging to trees like other bromeliads). They like high humidity and for their soil to never dry out making them perfect for terrarium culture. The small green one at the front is a hybrid called ”Earth Angel” and the one at the back to the right is “Cascade”. The large striped one I found at a big box hardware store and was unnamed so its a mystery to me. Does anyone know it? What a simple but clever and effective design. I really like this. thanks so much for posting on my blog!! i love your blog! so much fun! !